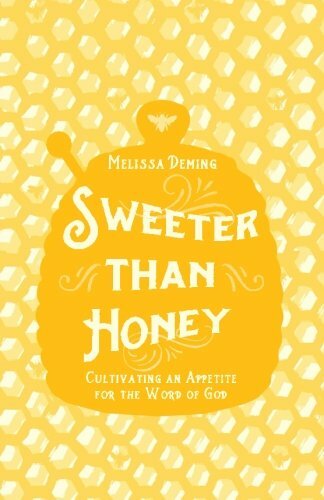 Sweeter Than Honey: Cultivating an Appetite for the Word of God by Melissa Deming. CreateSpace, 2016. 186 pages. Recommended For: Teens and up, especially for Bible study leaders. In 21st century America, we have an embarrassment of Bible study riches, do we not? And yet, it seems there is more biblical illiteracy now than ever before. Melissa Deming of Hive Resources has a passion for teaching women how to study the word of God, for encouraging them to taste God’s word and develop an appetite for it. In particular, she seeks to reach out to women who have not grown up in the church or who may never have studied the Bible before. Sweeter Than Honey works like a 5-week study program, a crash course in learning inductive Bible study. Drawing from Howard Hendricks’s Observation, Interpretation, Application method (including the 5 W questions, key words, and main ideas), Melissa outlines how to dig deep in God’s Word, avoiding shallow, surface treatments. Readers familiar with Kay Arthur’s inductive study methods will recognize a similar approach here. Melissa avoids “churchy” jargon. Helpful charts, personal stories, and specific examples walk readers through the method. A 31-day challenge at the end (on the book of Matthew) offers a practical place to start studying God’s Word. Whether you’re just getting started studying the Bible, or you’ve spent a lifetime studying God’s Word, Sweeter Than Honey is a helpful resource! Note: the reading level is not difficult, but Melissa’s text clearly targets women. This is a great resource to use to help teach tweens and teens how to study the Bible, but they won’t get as much out of the book as their mom or Bible study leader will. Melissa also has a great selection of “Guided Bible Journals” in her Heart & Hive Shop; newsletter subscribers, watch for a coupon just for Redeemed Readers in this week’s newsletter! Readers, what Bible study resources have helped you teach your children or students how to study God’s Word? Let us know in the comments! The post Sweeter Than Honey by Melissa Deming appeared first on Redeemed Reader.